After careful review of what is in the market, it is without a doubt safe to say that the Nest smart lock is properly designed to allow for easy usage. If you are a Nest’s ecosystem lover then this is the lock for you. However, if you are not within this ecosystem then perhaps you need to try another kind of lock. Everyone wants a smart home and not the traditional home that was all about bulbs connected by Wi-Fi and the Amazon echo. No, rather, a home that makes a home smarter and give greater convenience to those who inhabit it. The Nest smart lock gives you comfortable and convenient control over the security of your home. At a price of $280, you get to make an investment in both convenience and security. Well, is it worth it? An understanding of the benefits that the lock comes with insist that it is worth every dime it costs. Nest smart lock is a secure and tamper-proof key connected to the Nest app. It allows you to lock and unlock your doors from anywhere and even further, guarantees you of the status of the door through the Google assistant. So acquire this lock and get alerted every time someone leaves and arrives. The Nest smart lock needs to be connected to the Nest app for it to work efficiently. Once you have acquired the lock, you need to install it which is not a hard task so there is no trouble involved. The lock comes with a manual guide that illustrates diagrammatically how to install it so that it fits properly. In addition to the manual, Nest provides a video on the step-by-step process of installing the lock and as such endeavour to ensure you the client is satisfied. 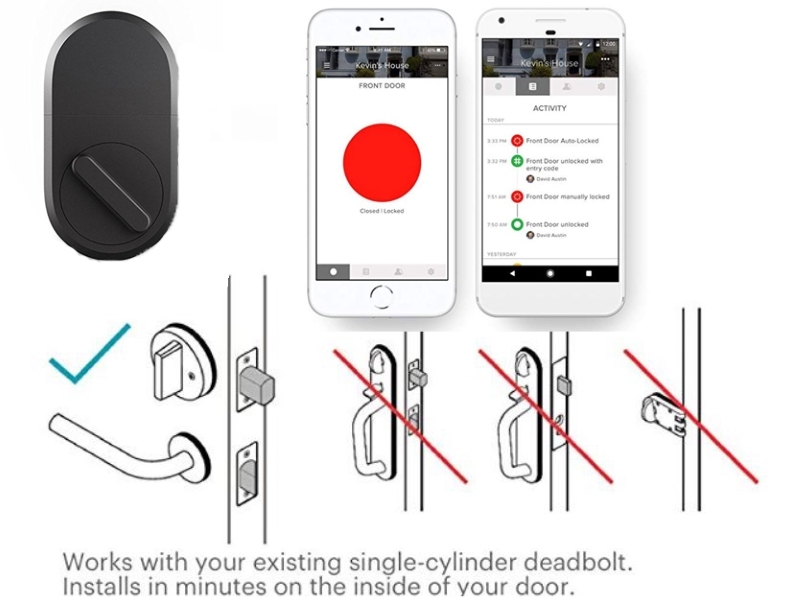 In a similar way to the other locks, the August smart lock gives one the privilege of easily locking and unlocking their doors without having a key. Coupled with a few locking and unlocking options, the grade 1 smart lock acts like a normal lock and can thus be locked or unlocked by turning the deadbolt. However, it is easier to use the keypad especially when opening the front door using the front lock. A one touch lock/unlock option is enabled although you will not receive as much alerts as with the other options and more so when you have muted the sounds. Unlike the previous Nest models, the new one supports or is rather compatible with Google assistant and as such you can check your status from any point. No one else will have access past your lock unless you give them a pass and such features make the smart door lock a guarantee of security. Nest has invested greatly in its software and see to it that the smart door lock works like magic to offer one the security they need. Get yourself a smart Nest today and be among the few that enjoy the top security that comes from these grade 1 smart locks. Secure, key-less entry for your smart home. Lock and unlock your door, control key-less access and keep track of who comes and goes, all from your phone. Stop hiding keys under rocks. Send guest keys from anywhere instantly—all from the smartphone app. Be sure you are secure with Door-sense to tell you the door is completely closed and locked. Installation & Lifetime Technical Support – 1 Year Replacement warranty.